His Divine Grace A.C. Bhaktivedanta Swami is such a spiritual master. Most people may think that to be humble and tolerant is the only qualities of a spiritual master, but, the real quality of a spiritual master is his compassion. Therefore he doesn't hesitate to speak out against an unjust and misleading civilization . These aren't someones small minded opinions that are eagerly shared hoping the change the world. This is standard knowledge coming from the Vedic culture, the oldest culture in the world. 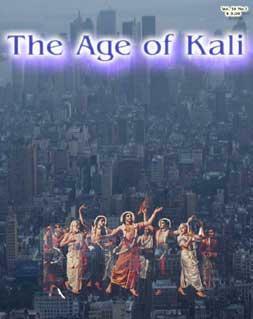 Age of Kali, a zine for spiritual awareness in a materialistic society, only wishes to present this knowledge as it is, showing how relevant and essential it is in our society today.